For the town in Karagandy Province of Kazakhstan, see Priozersk, Kazakhstan. Priozersk (Russian: Приозе́рск, known before 1948 in Finnish as Käkisalmi (Swedish: Kexholm) is a town and the administrative center of Priozersky District in Leningrad Oblast, Russia, located at the northwestern shore of Lake Ladoga, at the estuary of the northern armlet of the Vuoksi River on the Karelian Isthmus. It is served by a station of the same name on the St. Petersburg—Khiytola railway. Population: 18,933 (2010 Census); 20,506 (2002 Census); 20,557 (1989 Census). The main landmark of Priozersk, the Korela Fortress, has historically been the center for the Karelians of the Karelian Isthmus and from time to time the northwestern outpost of the realm of the Russians or the eastern outpost of the realm of the Swedes. From the Middle Ages, Priozersk was known as Korela to Russians and Käkisalmi to Karelians and Finns. The town was a part of Vodskaya pyatina of the Novgorod Republic. Novgorod taxation documents from 1500 list 183 houses in Korela, suggesting an estimated population of 1,500–2,000. The Swedes captured Korela twice: in 1578 for seventeen years and in 1611 for a hundred years. In the Swedish Empire, the fortress was called Kexholm and the whole region became known as the County of Kexholm. Russia definitively secured the area during the Great Northern War; the town's Swedish name was retained, however, as Keksgolm (Кексгольм). Unfortunately, wars and devastating fires in 1300, 1580, 1634, and 1679 took their toll on the civilian population. Consequently, when the town gained its first court house in 1800, the population was only 400. In 1812, as the Grand Duchy of Finland three years earlier had been formed within the Russian Empire, Tsar Alexander I incorporated Keksgolm with the rest of Old Finland (Vyborg Governorate) into an autonomous region. Keksgolm was the smallest city in the governorate. Since 1812, Vyborg Governorate was known as the Viipuri Province. In 1918, Finland became independent. Town's growth was boosted by the construction of the St. Petersburg–Hiitola railway in 1917 and by establishing two big saw mills and a big Ab Waldhof Oy's wood pulp mill in 1929. In 1939, Käkisalmi had a population of 5083. Around the town laid the rural municipality of Käkisalmi, with a population of 5,100. Minorities were Orthodox (946 persons), Swedish, Russian, or German. Total population was 11,129 in 1939. The Winter War on November 30, 1939 began with the Soviet attack. Eventually, after hard fighting, Finland was forced to cede Käkisalmi and the whole of Finnish Karelia to the Soviet Union by the terms of the 1940 Moscow Peace Treaty. During the Continuation War in 1941–1944, Finland gained back Keksgolm and other territories ceded to the Soviets in 1940. The population returned to rebuild the town, but were again evacuated at the close of World War II. Keksgolmsky District with the administrative center in Keksgolm was established as a part of the Karelian Autonomous Soviet Socialist Republic (Karelian ASSR) in March 1940. On March 31, 1940, the Karelian ASSR was transformed into the Karelo-Finnish Soviet Socialist Republic. On November 24, 1944, Keksgolmsky District was transferred from the Karelo-Finnish Soviet Socialist Republic to Leningrad Oblast. 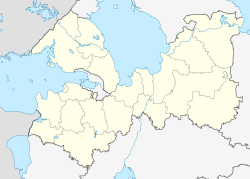 On October 1, 1948, Keksgolm was renamed Priozersk as a part of the campaign to rename localities in the areas annexed from Finland after the Second World War. Priozersk was settled with mainly Russians, Belorussian, and Ukrainian migrants, who have since comprised the majority of the local population. Within the framework of administrative divisions, Priozersk serves as the administrative center of Priozersky District. As an administrative division, it is, together with three rural localities, incorporated within Priozersky District as Priozerskoye Settlement Municipal Formation. As a municipal division, Priozerskoye Settlement Municipal Formation is incorporated within Priozersky Municipal District as Priozerskoye Urban Settlement. The main industrial enterprise in Priozersk is the former paper mill transformed into a furniture production plant. Priozersk railway station is located on the Saint Petersburg – Hiitola railroad connecting Saint Petersburg and Sortavala via Hiitola. There is suburban and long-distance service to Finland Station in Saint Petersburg. The town is connected by roads with Saint Petersburg, Vyborg, and Sortavala. Some remains of the pre-1917 Russian culture, mainly the Korela Fortress, survive. The ramparts and towers of the fortress are located on the bank of the Vuoksi, still visible when traveling to the town from St. Petersburg. There is a small museum in the fortress. Much of the remnants of the Finnish presence was destroyed. Priozersk contains thirty-three cultural heritage monuments of federal significance. The great majority of these monuments belong to the Korela fortress. The town is popular destination with the residents of St. Petersburg, many of whom have dachas in the vicinity (such as the Ozero community). ^ Карело-Финская ССР (PDF) (in Russian). Handbook of administrative divisions of Soviet Union. Retrieved March 12, 2014. ^ a b Кексгольмский район (ноябрь 1944 г. - октябрь 1948 г. ), Приозерский район (октябрь 1948 г. – феваль 1963 г., январь 1965 г.) (in Russian). Система классификаторов исполнительных органов государственной власти Санкт-Петербурга. Retrieved March 12, 2014. ^ Памятники истории и культуры народов Российской Федерации (in Russian). Russian Ministry of Culture. Retrieved June 2, 2016. Законодательное собрание Ленинградской области. Областной закон №32-оз от 15 июня 2010 г. «Об административно-территориальном устройстве Ленинградской области и порядке его изменения», в ред. Областного закона №23-оз от 8 мая 2014 г. «Об объединении муниципальных образований "Приморское городское поселение" Выборгского района Ленинградской области и "Глебычевское сельское поселение" Выборгского района Ленинградской области и о внесении изменений в отдельные Областные законы». Вступил в силу со дня официального опубликования. Опубликован: "Вести", №112, 23 июня 2010 г. (Legislative Assembly of Leningrad Oblast. Oblast Law #32-oz of June 15, 2010 On the Administrative-Territorial Structure of Leningrad Oblast and on the Procedures for Its Change, as amended by the Oblast Law #23-oz of May 8, 2014 On Merging the Municipal Formations of "Primorskoye Urban Settlement" in Vyborgsky District of Leningrad Oblast and "Glebychevskoye Rural Settlement" in Vyborgsky District of Leningrad Oblast and on Amending Various Oblast Laws. Effective as of the day of the official publication.). Законодательное собрание Ленинградской области. Областной закон №50-оз от 1 сентября 2004 г. «Об установлении границ и наделении соответствующим статусом муниципального образования Приозерский муниципальный район и муниципальных образований в его составе», в ред. Областного закона №43-оз от 27 июня 2013 г. «О присоединении деревни Большая Загвоздка к городу Гатчина и о внесении изменений в некоторые Областные законы в сфере административно-территориального устройства Ленинградской области». Вступил в силу через 10 дней со дня официального опубликования (24 сентября 2004 г.). Опубликован: "Вестник Правительства Ленинградской области", №27, 14 сентября 2004 г. (Legislative Assembly of Leningrad Oblast. Oblast Law #50-oz of September 1, 2004 On Establishing the Borders of and Granting an Appropriate Status to the Municipal Formation of Priozersky Municipal District and to the Municipal Formations Comprised By It, as amended by the Oblast Law #43-oz of June 27, 2013 On Merging the Village of Bolshaya Zagvozdka into the Town of Gatchina and on Amending Various Oblast Laws on the Subject of the Administrative-Territorial Structure of Leningrad Oblast. Effective as of after 10 days from the day of the official publication (September 24 2004).). This page was last edited on 26 January 2019, at 07:30 (UTC).